I'm not sure how many people have thought about how an artist might perceive Diego Velasquez rather than just an art historian. 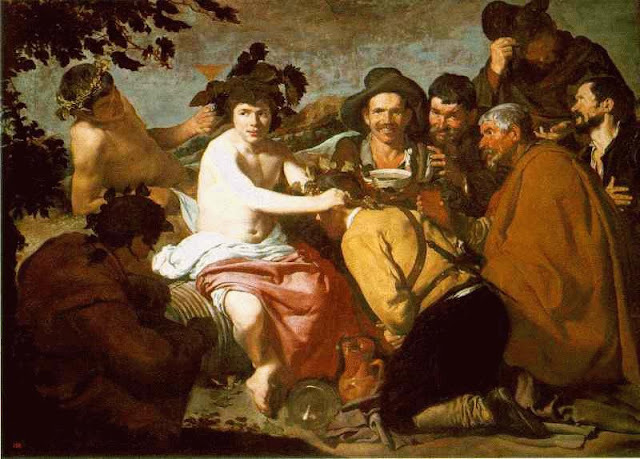 I think perhaps that many of my friends who artists and I agree on the fact that Velasquez was probably one of the greatest painters that ever lived if not the greatest. I suppose that most art historians stress the ideas expressed in the painting above called The Maids of Honor," because it is literally smoke and mirrors in the placement of the audience as the viewer and the king and queen as the audience or vice versa. For me, I think it's really about his formal or physical qualities. 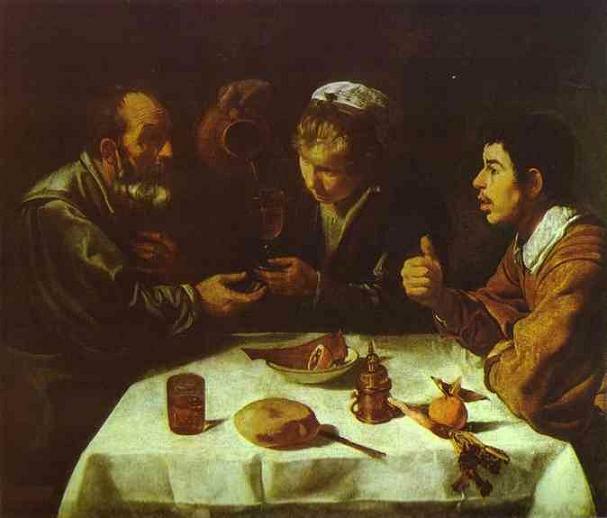 For example, Velasquez uses a lot of light and shadow and he's really good at using the light and shadow to create a sense of volume in space as well as unified the entire picture. However, in this painting he also uses light as a way to spotlight things and almost it seems as if he's influenced by dramatic lighting. In fact the theater was really going at this point in time, remember Shakespeare was around 1600 and most of Velasquez's painting state from the mid-1600s. In the foreground of the painting you see that the light sources the window which acts on the slightest spotlight on the Princess and the center of the painting and sort of creates a running line of figures almost like a relief sculpture from something like the Parthenon. However, in the background you can see that the Kings treasurer or money manager is highlighted in the doorway in the back. This is also kind of cool because some filmmakers have used that convention of the figure in the back with doorway quite a lot. For example in the movie Frida,Diego often visits Frida in her garden and the image is spot on the image in the background of Velasquez's painting.Sorry I could not find a film still. You also have to admire Velasquez's color, which is closer to a sepia toned photograph than it is to a full-color painting that we are used to. Velasquez only uses browns and oranges that are literally made from ground for such as burnt sienna, burnt umber, and yellow ocher. However, his paintings are incredibly colorful. His major focus is value structure and color, including warm and cool tones is an extra that just amplifies how the light works. Velasquez thickens his paint as it becomes lighter. In the spots in Velasquez's paintings in which the light is hitting the most Velasquez amplifies the effect by using thick layers of paint that are usually white sometimes with a touch of black to make it cooler and bluer which makes it actually project out of the warm background. In the background Velasquez cools off his grounds with charcoal black and using burnt umber. He also has a way of making people look completely real and contemporary even though they've been dead for centuries. You could pluck one of these people at the paintings and put them in a bar today and they wouldn't look out of place especially in the painting above that's called "The Drinkers," which is a depiction of Dionysus and his followers but the guys in this painting all look like they've been hanging out next to a bodega on the corner.